Here in Niagara, Mother's Day is also a blossom day. 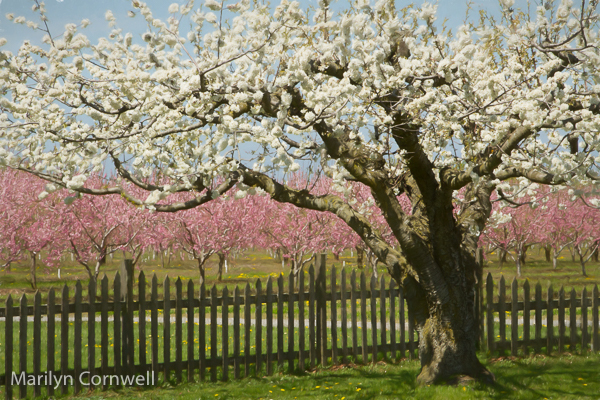 Where it is the Niagara orchards or the ornamental crab apples, there are always blossoms on Mother's Day. The next picture is what a garden club/horticultural society plant sale looks like 5 minutes before 200 people descend in a feeding frenzy. There were about 1,200 plants from member gardens and wholesale donations. One may think of all the member hours that go into a plant sale. But there are a lot of Dollarama products that go into it too. The pretty green table clothes, the metal sign stands, the dots on the pots that indicate the price point, the popsicle sticks with the plant names. Perhaps Plant Sale day is our Dollarama appreciation day too. We've traced the roots of Mother's Day in previous years. Anna Jarvis., the founder, had to work hard to get it established. The U.S. created it with a bill that was signed in both houses in 1914. President Woodrow Wilson was given credit for the idea of the official Mother's Day at the time. How did the commercialization happen? Hallmark Cards and their greeting cards, made it happen. Where are we now with this commercialization? Sign onto Google today and see the Google Doogle: a series story of a pregnant cactus and her journey as a mother from giving birth to her baby cacti, to taking care of it and finally living a settled life with the grown up babies. I consider this one a bit weird. Enjoy your family gathering today!